Der Sommer ist voll im Gange. Davon zeugen nicht nur die abgemähten Wiesen und die gelben Getreidefelder sondern auch die Stimmen der Vögel. Man hört nicht mehr den Kuckuck, die Schnarre und die Nachtigall. Nur Hausschwalben und Schwalben versuchen ihren Jünglingen das Leben lautstark beizubringen. Die jungen Weißstörche von Slitere müssen auch nicht mehr in ihrem Nest, das nun für die ganze Welt zu sehen ist, gewärmt und beaufsichtigt werden. Schon bald werden sie ihr Nest verlassen und ihr Glück bei der Jagd versuchen. Lassen Sie uns zusammen sehen, wie der erste Sprung ins Ungewisse verlaufen wird! Tawny Owl Strix aluco is the bird of the year 2011 in Latvia. It is the most common owl in Latvia. Although, there is word ‘forest’ in Latvian in its name, you may see it more often in parks, avenues or graveyards, as there are more great trees with appropriate holes for this bird. This is the 16th year when bird of the year is determined in Latvia. Usually rare and specially protected bird species owns this title, however, this year one of the most common nocturnal birds in Latvia was chosen to draw attention to its lifestyle and thus help it return to its home - forest as United Nations General Assembly declared 2011 as the International Year of Forests. Campaign organizer Latvian Ornithological Society (BirdLife Partner) in cooperation with Nature Conservation Agency invite everybody to make and place artificial tree holes – bird-houses. Harsh and snowy winters make it very hard for owls to find food as the thick snow with crust keeps mouse-like rodents safe from their claws. Winter like that was in year 2009/2010 when weak or already dead owls were find in many towns or forests in Latvia. If you find seemingly fearless owl, at this time of the year, carefully, trying to avoid their sharp claws, put this animal in a fir-tree where it cannot be caught by dogs or cats and it can’t be seen by crows – they don’t like nocturnal birds. However, if you find owl chicks in summer, you must not take them with you trying to “save” them. You have to remember that young owls leave their nest (tree hole) before they have learned how to fly, so the best that you can do is put this frustrated young bird on some bigger branch. Parents are somewhere near, watching you. Par 2011. gada putnu Latvijā ir nominēta meža pūce Strix aluco. Tā ir visbiežāk sastopamā Latvijas pūce. Lai arī sugas nosaukumā ir minēts vārds „mežs”, tur sastapt pūci varēsiet retāk nekā parkos, alejās vai kapos, jo šajās vietās ir daudz vairāk lielu dimensiju koku ar piemērotiem dobumiem. Šis ir sešpadsmitais gads, kad Latvijā tiek nominēts gada putns. Kā uzsver Latvijas ornitoloģijas biedrības valdes priekšsēdētājs Viesturs Ķerus – gada putna akciju laikā līdz šim uzmanība visbiežāk pievērsta retiem un īpaši aizsargājamiem putniem, taču šogad par gada putnu izvēlēts viens no parastākajiem naktsputniem, lai liktu cilvēkiem aizdomāties, kāpēc meža pūcei bieži vien nav vietas mūsu mežos, un ANO pasludinātajā Starptautiskajā mežu gadā aicinātu palīdzēt meža pūcei atgriezties mājās - mežā. Akcijas organizatori Latvijas Ornitoloģijas biedrība sadarbībā ar Dabas aizsardzības pārvaldi aicina sabiedrību gatavot un izvietot mākslīgus koku dobumus – pūču būrus. Bargās un sniegotās ziemās pūcēm ir grūti sagādāt pārtiku, jo biezais, nereti ar sērsnas kārtu klātais sniegs neļauj piekļūt peļveidīgajiem grauzējiem, kuri omulīgi pavada ziemu zem sniega. Tieši šāda ziema bija 2009./2010. gadā, kad daudzviet Latvijas pilsētās un mežos tika atrastas novārgušas vai jau nobeigušās pūces. Ziemā, atrodot šādu šķietami bezbailīgu pūci, vislabāk, uzmanoties no pūces nagiem, novietojiet dzīvnieku kādā eglē, kur tam netiek klāt suņi, kaķi un tas nav uzkrītoši redzams vārnveidīgajiem putniem- tiem ļoti nepatīk nakts putni. Savukārt vasarā, ja gadās uziet pūču mazuļus tos nekādā gadījumā nevajadzētu nekur nest un „glābt”. Jāatceras, ka pūču mazuļi ligzdu (koka dobumu) atstāj pirms iemācās lidot, tāpēc labākais, ko šādos gadījumos var darīt ir pūcēnus uzcelt kāda koka zarā. Pūcēnu vecāki ir turpat tuvumā un vēro jūs! Its autumn and cranes Grus grus are flying to coastal zone of the Mediterranean Sea or Northern Africa to spend the winter, but in March they will return to their nesting places in Latvia. There are approximately 10 – 20 nesting crane pairs in Slitere National Park. Cranes build their nest from reed and other plant parts on marsh isle or near to flooded territories. They made something like round bank where in the middle they lay two eggs. After a month chicks hatch and they are capable to follow their parents to seek for food just day after their birth. Cranes are vegetarians. They subsist on different plants, although, sometimes they feed on insects, frogs and even mice. Lapwing Vanellus vanellus is a bird which quite often is mentioned in Latvian folk songs. That is because lapwings are easy to notice in meadows, pastures and on fields. In any case this species live also in swamps and peat fields. Slitere have a lot of forests while agricultural land is rarely seen, that is why lapwing nest in the open part of Bažu bog. Grey Heron Ardea cinerea and Cormorant Phalacrocorax carbo are two species that nest in colonies close to water. Grey heron builds its nest in trees and sometimes in reeds of big lakes right onto fallen reed. Nest is quite sloppy and built from different branches where it lays 3-5 eggs. After about a month chicks hatch and stay in the nest for a few weeks. Parents regurgitate undigested food for the chicks to eat. As birds which feed on fish their droppings contain nitrogen, phosphorus and potassium that cause burned out spots on the ground similar to what is going on under White storks nests. Common Sandpiper Actitis hypoleucos is common nesting bird in Latvia. Nest is made on the ground not far from river, lake or pond where 3 eggs are lay. Male and female is brooding alternately for about three weeks. When hatched, chicks leave the nest. Common Sandpiper is a migrating bird that spends winter in Africa. It feeds on different insects, caterpillars, earthworms and spiders. Lesser-spotted Eagle Aquila pomarina is migrating bird which spends winter in Africa and South East Asia. It returns to Latvia in April and rush to occupy nesting territory. Lesser spotted eagle builds its nest in fork of deciduous tree branch or on side branches of a fir. Already in May two eggs are lay, however, only one chick usually survives. This is because the oldest chick kills the youngest one. Eagles feed on small rodents – voles and frogs. On First weeks of chicks life only male brings food to nest, while female sits on eggs and feed chick with small bits ripped off the game. Lesser spotted eagle is quite common nesting bird in Latvia. Here are nesting 3000 – 5000 pairs that are approximately 15 % of global population. Only 2-4 Lesser spotted eagles are nesting in Slitere National Park territory, as there are very few meadows where this eagle could prey. White-tailed Eagle Haliaeetus albicilla is the largest of diurnal birds of prey in Latvia. The widespread of wings reach up to 2.4m. It nests in grown forests usually not far from open waters – ponds, lakes or seas. Nest is build on top of a tree of solid branches. Number of White-tailed eagle has grown during last 10 years. 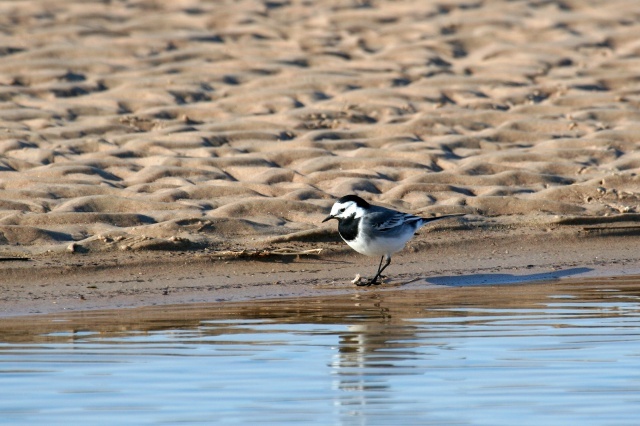 Now in Latvia about 100 pairs are nesting. This year for the first time in Slitere National Park was found inhabited nest. Hooded Crow Corvus corone cornix is a common bird in Latvia, usually can be seen all year. Most of those nesting in Latvia spend winter in Western Europe while hooded crows from East and North spend the winter in Latvia. The mind of Raven Corvus corax is sometimes compared to intellect of a dog or monkey. They benefit from other animals by using them. For example, predators know where their prey is when see or hear ravens circle and croak above the forest. Ravens use this kind of showing, because they are not able to hunt down deer, moose or roe. They know that by showing wolves the pray there will be some leftovers for them to eat. Ravens use people similarly. Northern people knew that they would gain a kill by following ravens. And so they would always left bowels for ravens. This is why raven is sacred animal to Northern people and the killing of this bird is a sin. In this video material you will see nest built on byre pivot where both parents bring food to the chicks. Aizdomīga paskata ēdmaņai klinšu ērglis tuvojas uzmanīgi. Nolaidies drošā attālumā, tas kādu brīdi novērtē situāciju (kājas kadra augšpusē), tad, briesmas nesaskatījis, uzdrīkstas uzsākt ēšanu. Šoziem ērgļi var būt ļoti izvēlīgi, jo kritušu zvēru ir pārpārēm. Nospriedis, ka šis nav tas labākais piedāvājums, ērglis dodas prom.